Slow Cooker Mississippi Pot Roast recipe is a comforting, tasty meal made right in your crock pot. The meat drippings produce their own gravy and the roast is so tender that it just falls apart! I hope everyone is having a great week! Looking forward to the weekend already over here. I’m so excited to share this Slow Cooker Mississippi Pot Roast recipe with you today. It’s seriously the BEST pot roast ever and it makes it’s own gravy, which is the best part. It truly is one of those “set it and forget it” type of recipes. The only pot roast that might be as good is my Crock Pot Coca-Cola Roast, which is very similar to the cooking method of this one. 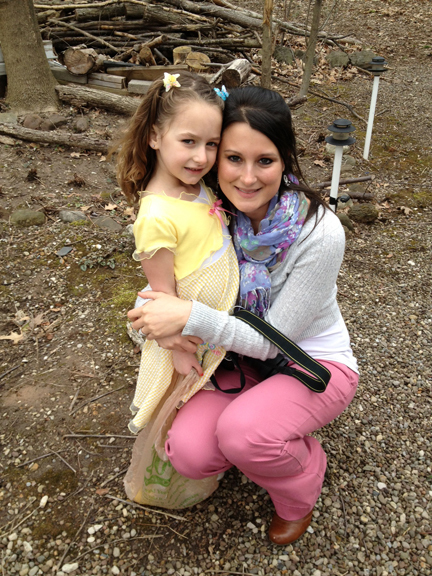 Our Easter was really nice. We had brunch at my in-laws house which included amazing homemade Belgium waffles with fruit topping, baked french toast, and basically every other breakfast or lunch food you could possibly imagine. It was quite the feast. We had an Easter egg hunt for all the kids in their backyard after brunch where we hid 250 eggs full of candy, 2 of which were never found. I guess we tried harder to make the hiding spots a little more challenging this year….perhaps a little TOO challenging. Let’s just say there was some tree climbing involved in the placement of these eggs and I think the adults had more fun hiding the eggs than the kids did hunting for them. Hey, ya gotta make the kids work for the candy, right?! We then went to my mom’s place and had a delicious ham, sweet potatoes, and lots of other side dishes. The carrot cake I made for dessert was a big hit so I’ll be sharing that with you soon! It doesn’t happen often, but once in a while I get a craving for a good pot roast. This Slow Cooker Mississippi Pot Roast is the easiest way to fix the most delicious chuck roast! You will not be disappointed. It was tender, juicy, and fell off the fork. For even more flavor in this pot roast you could sear all the sides of the meat in a frying pan with some oil to get that caramelizing brown goodness before you add it to the slow cooker. That step is really not necessary, though. To sear, or NOT to sear? That is the question! 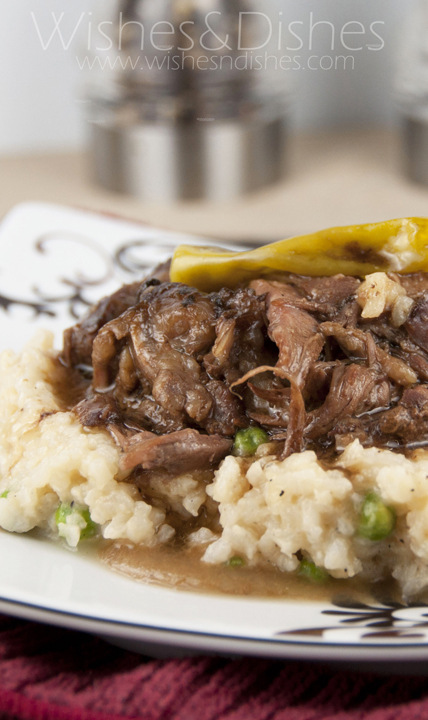 Also, the peppers do not make this Slow Cooker Mississippi Pot Roast hot, it just makes it more flavorful. This type of pepper is more vinegary than spicy. I would not skip them because they really put this dish over the top. 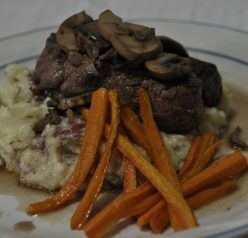 I served this over baked parmesan risotto, but it would also be good over garlic smashed potatoes or egg noodles. Make sure you check out my step-by-step video below on how to make this Slow Cooker Mississippi Pot Roast. It’s super easy! 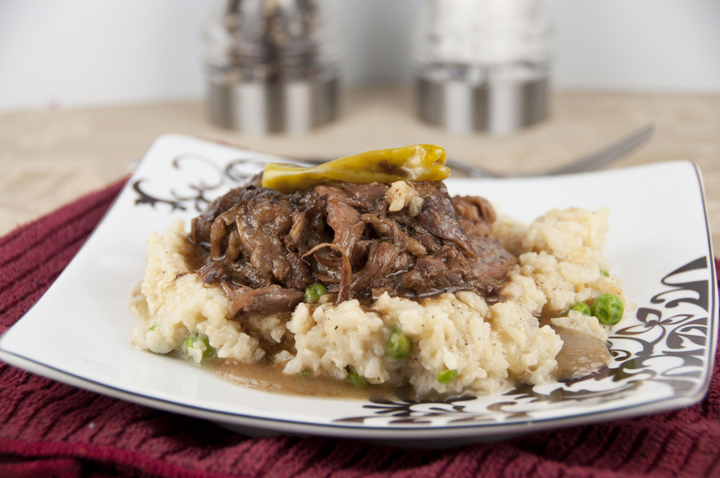 Slow Cooker Mississippi Pot Roast is a comforting, tasty recipe made right in your crock pot. The meat is so tender that it just falls apart! Place a large skillet on the stove top on high heat. Add oil to hot skillet. You want it really hot here to brown or “sear” the beef quickly. Take a paper towel and make sure you dry both sides of the pot roast (drying the meat helps it brown easier.) Season both sides with a little salt and pepper. Add the roast to hot skillet. Allow the roast to cook for about 2-3 minutes (on each side) until it is golden brown. This gives it extra flavor. In a 5 or 6-quart slow cooker/crock pot, place roast in slow cooker and sprinkle Ranch dressing mix and Au Jus mix on top. Top with 1 stick of butter and the pepperoncini peppers (not the liquid...NO liquid gets added to the slow cooker). Cook in the slow cooker on low for 6 to 8 hours (mine was done in 5 because my slow cooker cooks hot). Shred the meat and serve with the gravy/juice from slow cooker on top. If you prefer, put the drippings through a gravy separator to reduce the fat content. Serve on top of rice, egg noodles, risotto, or mashed potatoes! Thanks, Kayle! I did and hope you did, too! Cute photo!! 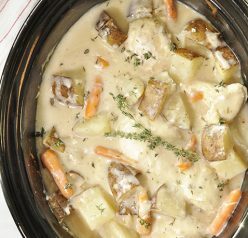 I love your dark hair 🙂 I was just telling my husband the other day that I have been craving a pot roast and that I didn’t have a great recipe for one – your blog has come to the rescue! We’re supposed to have a few more cold days next week so this will be the perfect meal to come home to after work! It’s super cold here still, too! Spring seems to be in hiding. Thanks for the compliment about my hair – that’s my natural color. Enjoy the pot roast! This looks delicious! I love slow cooker recipes, and I love anything with a kick of spice, so I’ll have to try this! You will definitely love this then! Thanks for commenting, Laurie! Thanks, girl! Hope you did too! My husband is obsessed with pot roast, and I must admit, I rarely take the extra time to sear the meat. When it’s drowned in gravy or thrown on the floor by my kiddos it doesn’t always seem worth the effort. 🙂 What a cute picture of you and your niece! I normally never sear the meat, either! I think it turns out just fine without that extra step, but I know some people like to do it 🙂 Thanks, Ashley! Wow, 250 eggs? Sounds like a ton of fun! Pot roast is so great, isn’t it? Yours is a nice and easy version – I like that! Sounds delish – thanks so much. Yup, 250 eggs. Way more than we normally have! Thanks for the comment, John! This sounds so good. I’ll be making it soon! You mentioned baked parm risotto, would you mind sharing this recipe? 🙂 Thank You! I would love to have risotto recipe too ! Oh please post the risotto recipe here. I would love that one! O.K. This might sound really stupid of me….but the pepperoncinis….are they fresh or the pickled kind that I buy in the jar? NOT a stupid question!! I used the ones in the jar 🙂 Thanks, Janelle! I love vegetables with my roasts…would this be a good recipe to add veggies too? I don’t see why not!! Thanks for stopping by, Melissa! Do you put your roast in frozen or thawed? Thanks! I would love to see the baked risotto recipe mentioned above also. Sounds delish! Making plans to try the pot roast in the next week. I made this using au jus GRAVY mix (minus the pepperoncinis) and didn’t have to thicken the sauce at all. It was the best pot roast I ever made and the easiest too! You don’t add any liquid to the crock pot? It doesn’t turn out dry? I have always added water when I make a roast. I don’t want to mess it up when I make it 🙂 It sounds yummy. Hi, Kellie! Nope, no liquid added 🙂 The roast will make it’s own juices and won’t dry out. It’s sooo good – I hope you try it! Could I do in oven? I made this recipe from your blog a while back and forgot to tell you how amazing this dish turned out!! It is seriously one of our favorites now. Thanks for sharing!! Stephany, that comment made my day. Thank you so much for letting me know! I love hearing good feedback. 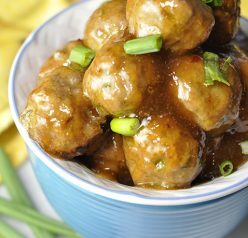 Can you use dry beef gravy mix instead of au jus? It would change the flavor a bit but I don’t see why it wouldn’t work! Hi. Is there any gluten in this recipe? I have made this a few times for my family and love it! We have company from Australia over and one of them cannot have gluten. Was hoping I could serve this dish. Thank you! I do not believe so but you may want to double check!